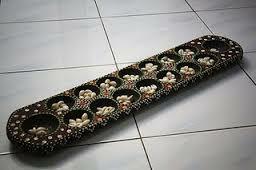 The congklak, or dakon board game was brought to Indonesia by Indian or Arab traders centuries ago. Made from plastic or wood, or highly carved by court artisans, this game has been played in Indonesia for centuries. Dakon is two-row multiple lap version of the Mancala family that is played in Java. It is usually played on a wooden board with holes carved in it. The counters may be seeds, stones or cowrie shells. The rules of Dakon are very similar to those of Congkak played in Malaysia, and Sungka played in the Philippines. Dakon is played by two players on a 2 x 7 board with seven seeds in each hole at the start of play as shown in Figure 1. Each player has a store hole at the right-side of the board. The players take turns. A player begins a turn by picking up the contents of any hole from the row on his side of the board and then placing one seed at a time in each hole in a counter-clockwise direction from the start hole in the manner of sowing seeds. The player also sows a seed into his own store but not into his opponent's store. If the last seed is placed in an occupied hole, the player takes its contents, including the last dropped seed, and begins another lap by continuing to distribute the seeds in a counter-clockwise direction. If the last seed is placed into his store, the player begins another lap from any occupied hole on his side of the board. If the last seed is placed into a vacant hole on the opponent's side, the player's turn ends and no capture is made. If the last seed is placed into a vacant hole on the player's side, and the opponent's hole directly opposite is occupied, the player captures the contents of his opponent's hole as well as the single seed just placed in the capturing hole and puts all these seeds into his store. The player's turn ends. If the last seed is placed into a vacant hole on the player's side, and the opponent's hole directly opposite is vacant, the player's turn ends. If it is a player's turn to move and he has no seeds on his side of the board, he forfeits his turn. The round is over when all seeds are in the two stores. The next round now starts. Each player using the seeds captured in the previous round fills as many holes as possible with seven seeds from his store beginning from his right-hand side. The player having the more seeds, having filled his seven holes, puts the remainder of his seeds back in his store. The player having the fewer seeds puts any extra seeds that do not make seven seeds in a hole back into his store. For example, if after the first round one player had 68 seeds and the other 30 seeds the board would appear as shown in Figure 2. The unfilled holes are marked with a piece of paper to indicate that these holes are out of play for the next round. The player who made the last move of the preceding round sows first in the new round. The second and following rounds are played with the same rules as the first round except that only the holes occupied at the start of the round are used. In later rounds it is possible that the player with fewer seeds may capture sufficient to reopen some previously closed holes. The game is over when one player has less than seven seeds and is unable to fill at least one hole for the new round.